Facebook says it is investigating a mother’s complaints about a post that misused photos showing her child with a severe case of chickenpox. The message claimed the boy instead had cancer and that the social network would donate money for surgery if users “liked” it or wrote comments. Several hours after the BBC reported the matter, Facebook removed the post but left its creator’s account active. More than a million people had engaged with the message since 1 February. One security expert warned these users might now be targeted by scammers. Sarah Allen, from St Neots, Cambridgeshire, gave media interviews in August 2016, after her then two-year-old son Jasper was covered head-to-feet in sores after contracting the virus. She believes that images posted within articles about his illness were then stolen to create the fake post. 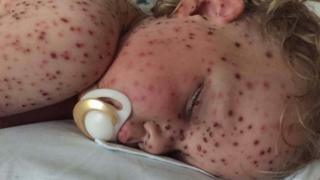 “We were warned people might take his pictures… because if you Google chickenpox his pictures are there,” Mrs Allen told the BBC. Mrs Allen said she repeatedly messaged Facebook to complain about copyright infringement and was told on 10 February that the account in question had been removed for breaching the site’s rules. However, she said, it was back online within 24 hours, without explanation. The profile continues to feature posts with identical text that show images of other children, and in one case a bearded youth – despite the words referring to a “little baby [that] has cancer”. 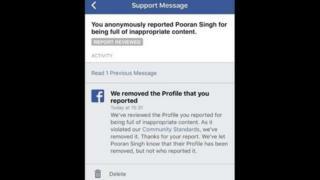 Other posts from the account – which claims to belong to Pooran Singh – show images of children in hospital claiming the viewer will experience years of bad luck if they scroll down without liking and sharing. “What’s so disgusting [is] it’s not just Jasper’s pictures but [about] 100 of other people’s families as well,” Mrs Allen explained. The owner of the account did not respond to a request to explain his or her actions. But one security blogger said this appeared to be a case of “link farming”, in which scammers seek to make people interact with a Facebook post so they can either direct further messages to them or sell on the profile and all its contacts. “There are a lot of scams that use these kind of emotional images – oftentimes it’s done to make money,” Graham Cluley explained. “They may later post something that claims you’ve won a prize and try and get you to enter your mobile phone number and then sign you up for a premium rate service, or ask for other personal information. Facebook says it is still reviewing the case with its complaints team and declined to comment further until this process had been completed.